By now, you must know of my fondness for Snickers bars. It doesn’t get much better than a candy bar coated in peanuts and caramel and dunked in chocolate. I mean, wow. Unless, that is, you turn it into an Ice Cream Snickers Bar. Like, whoa. As you might’ve guessed, it was only a matter of time before I smooshed together my love for Snickers and cheesecake. The results? Totally drool-worthy, and it all happens with just 10 simple ingredients. This cheesecake begins with my go-to date-walnut crust. Dates, walnuts, and sea salt whirled together to create a tender, naturally sweetened base for our cheesecake. While the crust sets in the freezer, it’s time to move on to the 1-ingredient date caramel. ONE INGREDIENT, people. It’s magic. 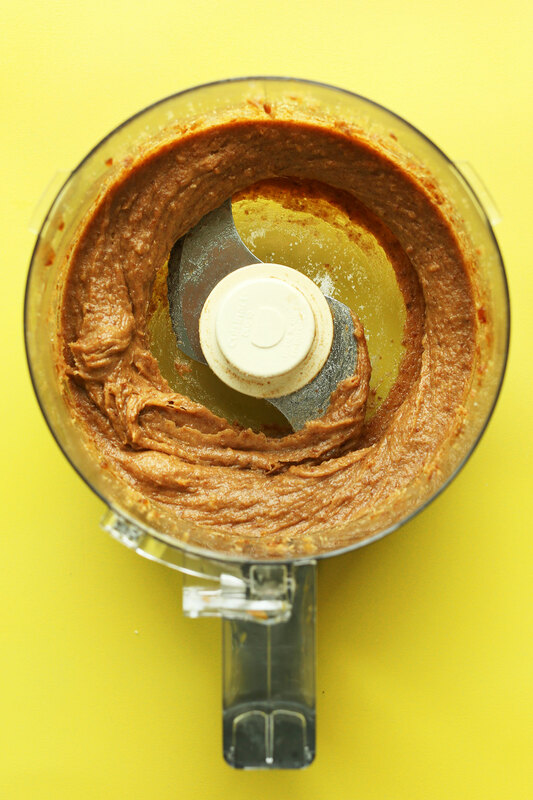 Simply add dates into a food processor and thin with a little hot water. Voila – we have a caramel ribbon ready to swirl through our cheesecake. Next comes roasted salted peanuts for that salty-sweet flavor contrast and added crunch. Swoon. The hard part is waiting for it all to set in the freezer for about 4-6 hours. But it’s so worth the wait. This would make the perfect dessert for a weekend treat or to celebrate special occasions (you know, like Tuesday). 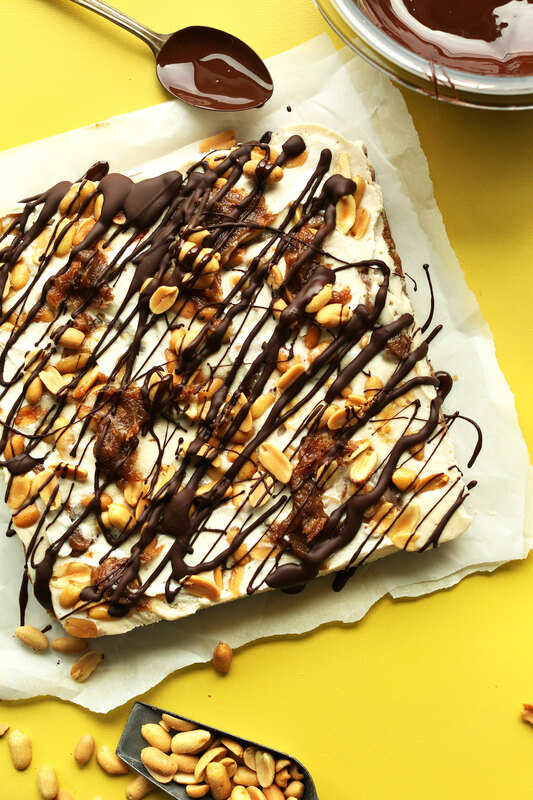 It’s naturally sweetened, insanely rich, and truly reminiscent of a Snickers bar. If you give this recipe a try, let us know! Leave a comment, rate it, and tag a picture #minimalistbaker on Instagram so we can see what you came up with. Cheers, friends! 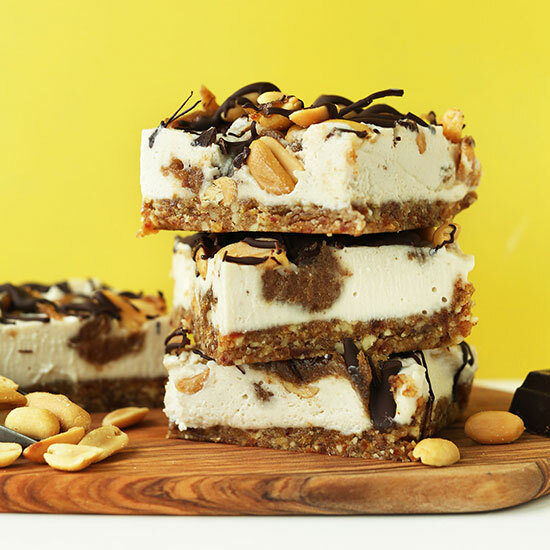 Rich, 10-ingredient vegan cheesecake infused with the flavors of a Snickers bar: caramel, peanuts, and chocolate. Add cashews to a bowl and cover with boiling hot water. Let set, uncovered, for 1 hour. Then drain thoroughly. Also line an 8x8-inch baking dish* with parchment paper. Set aside. In the meantime, make crust by adding dates to a food processor. Blend/mix until small bits remain or it forms into a ball. Remove and set aside. 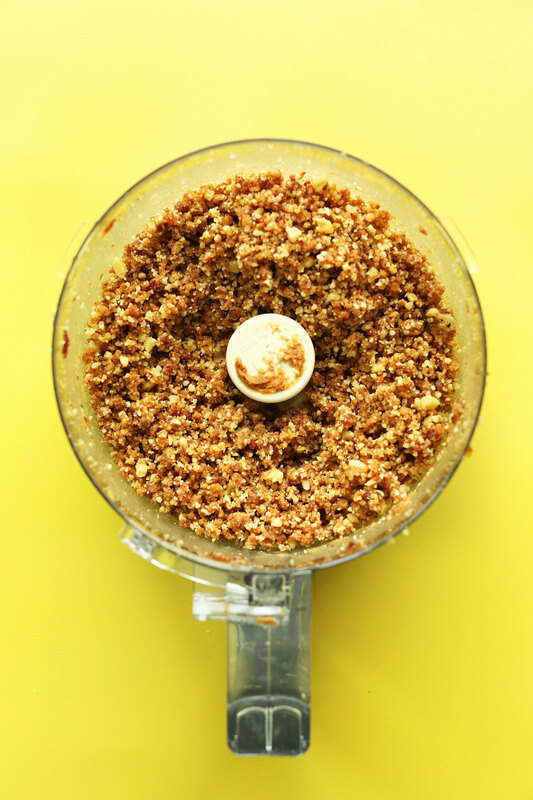 Add walnuts and sea salt to the food processor and process into a meal. Then add dates back in and blend until a loose dough forms - it should stick together when you squeeze a bit between your fingers. If it's too dry, add a few more dates through the spout while processing. If too wet, add more walnuts. Press the crust into the parchment-lined dish (see photo), until uniformly flat. I like to lay parchment paper on top and then press down with something flat - like a liquid measuring cup - and press down so it's firmly packed. Set crust in freezer to set. Next make date caramel by adding 3/4 cup dates (amount as original recipe is written // adjust if altering batch size) to the food processor. Blend until a paste forms, then add hot water a little at a time until it forms a nice caramel-like paste that's spreadable. Try not to add more than 3-4 Tbsp (45-60 ml // amount as original recipe is written // adjust if altering batch size), which will depend on the freshness of your dates. Set aside. Add your drained, soaked cashews to a high speed blender, along with vanilla (optional), maple syrup, coconut milk, sea salt, oil, and lemon juice. Blend on high until creamy and smooth, scraping down sides as needed. Taste and adjust flavor as needed, adding more lemon for brightness, salt for flavor balance, or maple syrup for sweetness. Pour filling over the crust and tap on the counter to release any air bubbles. Then add half of the date caramel in small spoonfuls and swirl with a toothpick or chopstick (see photo). 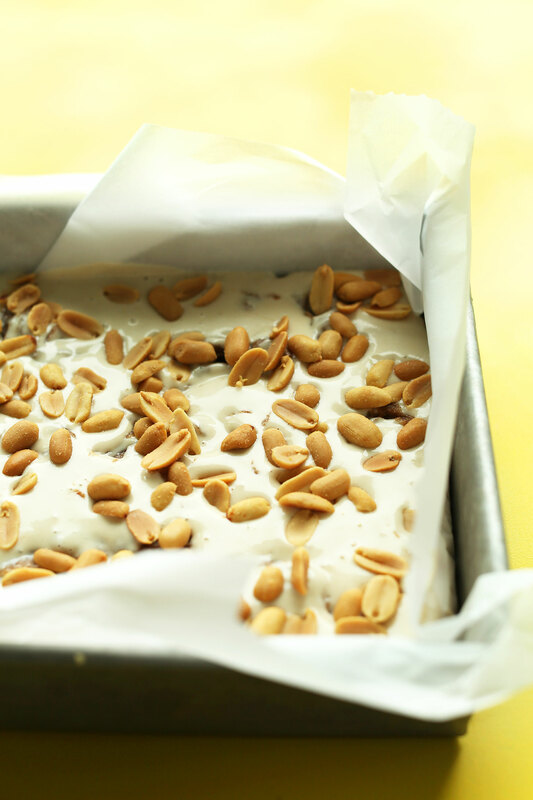 Sprinkle the peanuts on top and tap once again so they gently sink in. Cover lightly with plastic wrap, and then seal the top with foil. Freeze for 4-6 hours, or until completely set and firm. When ready to serve, set out cheesecake (to thaw briefly) and top with remaining date paste and a few more roasted peanuts (optional). In the meantime, prepare chocolate sauce. Add chocolate and coconut oil (optional) to a ceramic bowl and set over a small saucepan with 1 inch simmering water (over medium heat). Stir occasionally over the simmering water until melted (alternatively, melt in the microwave in 30 second increments). Drizzle the chocolate over the cheesecake, slice into 9 to 12 bars (amount as original recipe is written // adjust if altering batch size) and serve. Enjoy immediately. Store leftovers in the freezer up to 3 weeks (best in the first week). *If you'd like to turn this cheesecake into a round cheesecake shape, see this post for tips. If you'd like to make mini cheesecakes, use this post for tips. If you'd like to make this into 4 small cheesecakes, see this post for tips. *Nutrition information is a rough estimate calculated without additional coconut oil in the chocolate sauce. I made this last year for my vegan daughters and I was super surprised at how delicious it was! Seriously yum. I’ve by and large given up sugar and dairy this year and thought I’d give it another go. I can’t wait till Sunday! I’m going to make this recipe for the birthday of a friend of mine. She’s allergic to peanuts, so she asked me to make it with either almonds or cashews. At first my thought was cashews are already used in the filling, so why not use (salted) almonds for topping. But i also want to wow with this recipe because friends of us do never eat vegan unfortunately. So I thought maybe (salted) cashews come closer to the taste of salted peanuts than almonds. What would you recommend? And would you recommend the almonds or cashews also salted on top? We haven’t tried it, but think roasted cashews would be great! Salted or unsalted for the filling and salted for the topping. If you give it a try, we would love to hear how it goes! I did make it and put salted cashews and a few roasted almonds on it. THEY LOVED IT (and me tooo)! Thanks so much for sharing, Lucinda! We are glad to hear this! I made this two days ago and I looooove this raw cheesecake. It’s just the right amount of sweetness, nuttiness, and creaminess for me. Mine doesn’t look anything like the pic in the recipe, nor do I think it tastes anything remotely like a snickers bar…mine tastes kinda similar to a tiramisu with a hint of coconut. The walnut base is so yummy. My caramel sauce blended into the cheesecake instead of forming a hard crust on top but that was fine by me. I blended and heated raw cacoa nibs with coconut oil to make the chocolate and it really complements the caramel sauce. Next time, I will soak the walnuts that’s in the base and add cinnamon to it. I also will make a bigger batch for the filling because I wanted more “cheesecake.” My boyfriend, who is a chef said it needed to be sweeter, but I don’t know what he’s talking about. This looks incredible! Just wondering if the recipe freezes well? Im hoping to cut into little squares and freeze for the holidays. Yes! Store leftovers in the freezer up to 3 weeks (best in the first week). I made this last night, instead of the date Carmel, I made the coconut Carmel sauce from the cookbook. It was so yummy! I like the subtle sweetness, and if anyone wanted there’s more sweet, I had extra Carmel sauce for them. The adults and my 4 year old enjoyed it. My sister’s 8 year old didn’t like it as much, but she is used to eating a lot of sweets and junk food, so I think my “healthier” dessert wasn’t sweet enough for her. I had some issues blending the dates but that has nothing to do with the recipe I think, but with the quality of the dates. My food processor struggled very much and I had to add some water to the dates (for the crust) and then mix the walnuts and blended dates with a spoon because I felt my food processor couldn’t handle the stickyness/heavyness of the dates anymore. I also used a baking dish that’s probably slightly bigger than 8x8inch, and wish I could’ve made some more of the white filling because it turned out to be a very thin/flat cake, but that is also my mistake. Besides struggling a little, the flavour of the white filling blew me away! And the combination on top of the salty-sweet-nutty crust is really great. I used almond milk in stead of coconut milk. I love the taste of this but texture-wise it is not very much like what I remember cheesecake to be. I just made this for my sister’s birthday! It tasted so so so gooooood and everyone was super satisfied with it!! I substituted the coconut milk with coconut yogurt instead and the taste was amazing :) Thanks for sharing! Ok, I made this today. I have only just found your blog, and you now have my undivided attention. I am looooving your blog and your recipes. Just tasting the cashew base for this made me so happy. Add in the dates and the chocolate…YUM! I’m sharing this dish with my recipe group tonight (we are a sugar-free, dairy-free, and gluten-free recipe sharing group). Thanks!!! I made this for my boyfriends birthday today and it was a total crowd pleaser! Thanks so much for this awesome recipe. Greetings from Holland! I made this last year for my bday and I loved it so much that I had to give most of it away to keep from eating it all! Have you ever tried using stevia instead of maple syrup in the filing, or does it need the syrup to help it set? Hi! We have not tried it, but if you do let us know how it goes! Made this last week, so delicious even my non vegan hubby who is a sself-confessed snickers addict loved it! He even asked me to make another batch for his workmates and to impress the boss! Winner snickers! Hi! Question: when you say coconut milk, do you mean the kind that comes in a can or do you mean the coconut beverage that is more along the lines of almond/rice/soy milk? Hi Nia! For this one, we are referring to the coconut beverage! Any non-dairy milk will work for this though. Cheers! To “Support” re: coconut milk ~ Are you sure that it’s the coconut beverage for this recipe? Her ingredient list says “full-fat coconut milk”, and in her response to Deanna above, she says to use the canned coconut milk. I just want to clarify! Hi! Sorry about that, it is the coconut milk in a can, but you can sub another dairy-free milk, such as almond or rice! OMG this was delicious! So simple and easy to make too! My partner and I loved it and even had an after breakfast dessert the next day because I had been dreaming about it all night and couldn’t wait until dinner time for my next slice! I didn’t have enough cashews, only about 2/3 of the amount so I topped it up with banana instead and it worked really well and the hunt of banana flavour made it even better in my opinion. Thank you so much for this creation! OMG!!! Each week I have dinner with 7-10 of my dearest friends. They put up with my “GF, non-dairy, no eggs, no almonds, no a bunch of other things” so well cuz they love me. Tonight I took this cheesecake to our dinner and it was a total “10”!!! I just sent the recipe link to everyone. It is rich, creamy, dreamy and totally divine. Better than traditional cheesecake. Thank you for a fantastic recipe, Dana! It was so yummy I ade these tonight. They don’t look exactly like yours but really close. The only thing is when I took them out of the freezer the filling tasted not as sweet. It was like a ice cream cake. Not a cheese cake. I think I should have put it in the refrigerator instead. I have made this so many times and everytime it is a hit! Just a note in case anyone is interested, I used the biscuit style base form the lemon bars reipe in stead of dates and walnuts and it works so well!! I made this today and it is honestly the most amazing cake I’ve ever had. Seriously, everyone has to try this! Can someone help me? I am new to vegan cooking so I am not sure if when it says to use “full fat coconut milk” if she is referring to the liquid at the bottom of the can of milk or if you mix the fat with the liquid first (bc it is typically separated) and then measure the amount needed after combining the layers. Thanks! Omg! I just put it in the freezer. The Hardest part is waiting FOUR HOURS….the rest is a piece of (vegan cheese) cake! 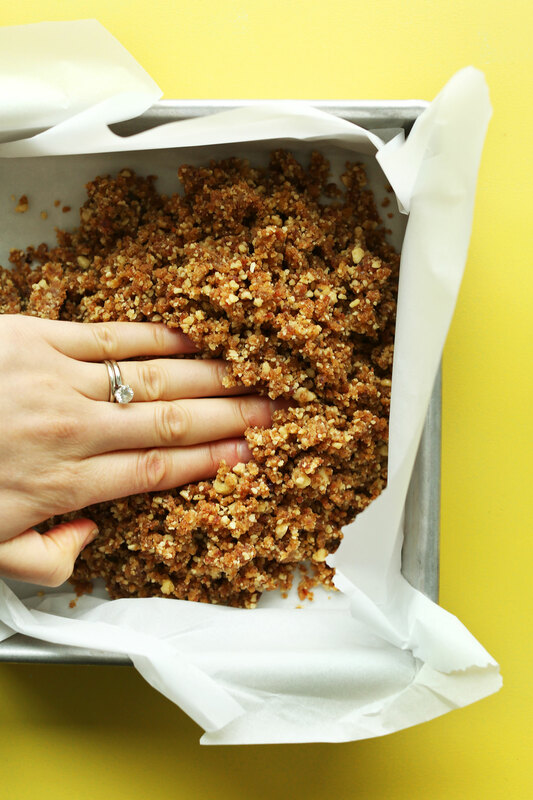 Do you soak your walnuts before making the crust? I’ve made this twice, and it was delicious both times, but the crust has me stumped. It comes out tasty, but the texture is off. I’ve soaked my walnuts both times. Is that what I’m doing wrong? Hmm, nope! I use them raw! Not sure! These are so good! Even my dairy-loving family members loved them and only knew they were vegan because they were made by me. I was able to travel with them by putting them in a freezer bag with an icepack. Otherwise, I think they’re best straight out of the freezer. Oh, and for those of you who buy “pitted dates” make sure you check for pits anyway because that label is usually a lie (and you can really hurt your food processor). Thank you for sharing, Dana! Yo! Love this! Made it for my birthday and am already looking forward to making it again!!! I made a modification that I submit to you for future use: peanut buttercream frosting. 1 part TJs salted creamy peanut butter 3 parts coconut milk (Chaokoh) and 1 part date sugar. Food processor that and drizzle it in the chocolate topping to make that fancy swirl. It has a softer melting point so it breaks up the texture if you’re like me and instead of drizzling a little bit of chocolate on top, you melted half of a pound plus bar and COVERED the cheesecake with it. I think the best part about this is getting dessert without having a major sugar freak out. I love dates, so magical! The coconut oil curdled in it and it wasn’t edible! Super disappointed. I’m in the middle of making this and I want to take it to work tomorrow to share with my colleagues, but I have a question about the whole take-out-of-the-freezer-before-serving-part. What happens if I store it in the fridge? Will it go runny? And if I do keep it in the freezer and then take it out, are you supposed to eat it slightly frozen? It will work in the fridge but will be soft and it needs to be frozen first to set! In short it’s best in the freezer. WOW! Turned out much better than I expected and it tasted amazing will be making another cake this weekend! O. M. G. Made this last night for Shabbat dinner. Out–Standing!!!!!!! Wow! Made a lot of vegan cheesecakes in my life. This one is unbelievable. A lot of steps, but not difficult and you can use the processor twice between the crust steps and the date caramel without washing, so that’s ok. A true knockout. Hi, Do you think you could substitute the coconut cream for coconut yoghurt? Your posts are inspired! What great recipes and ideas to encourage people to try out vegan recipes! My non-vegan family thought these were awesome! They thought they were more of a ‘snickers square,’ instead of a cheesecake but as a vegan I can appreciate how these were cheesecakey. You cannot go wrong with chocolate/peanuts and date caramel! Umm, this was amazing. Made it for my family, who all love Snickers and dairy, and they couldn’t believe that it was dairy and gluten-free. 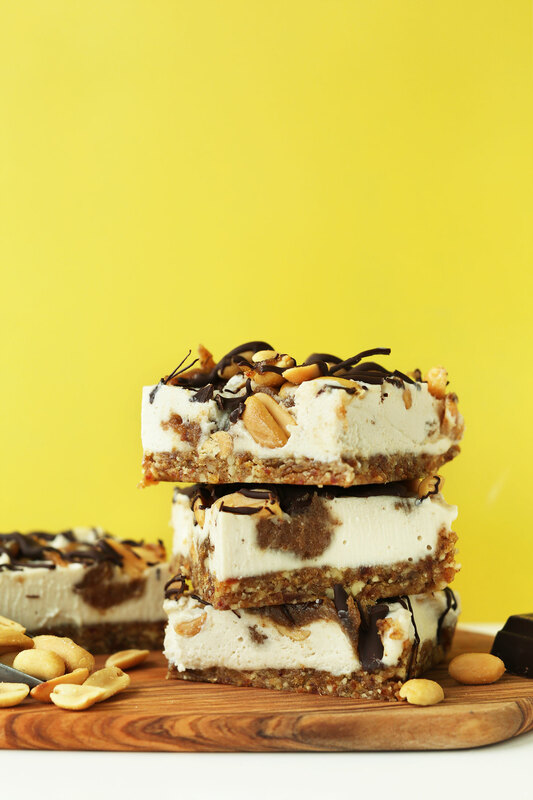 I used almond milk rather than coconut milk, and so the consistency was like a Snickers ice cream bar rather than a cheesecake, but this was not at all a problem for us! :) I also made my own salted caramel sauce to go on top in case the dates didn’t give the same “caramel” flavor that they were used to, but everyone agreed it was completely unnecessary. Amazing recipe. OH MY YUM! I love both snickers and cheesecake, aka this was made for me! Oh sweet mercy the snickers cheesecake is next level. It is hands down the most delicious raw cheesecake I’ve ever made. This is so delicious! But although I followed all the instructions to make your date caramel, it didn’t look anything like yours. I processed the dates for at least two minutes, and they didn’t form a paste. I processed them a bit longer but they stayed the same: just date pieces. So I went ahead and added the hot water, and they just looked like wet date pieces. They tasted amazing though. Any suggestions for next time so they look a bit more caramel-y? hello Dana! I tried the recipe yesterday but hadn’t read it till the end before I started…so I panicked when I arrived at the freeze-eat-immediately part of the recipe (LOL). I made a few changes to the recipe (brazilian nuts instead of cashew; treacle instead of maple syrup), but what caught my attention was that I didn’t have enough to cover the bottom of the pan – and it wasn’t more than 3mm thick! what I did instead was to assemble in small jars with lid, so I can take them still frozen to the office for either a breakfast or mid-afternoon snack. I loved it, even if there was no chocolate on mine! I had never mixed lemon to coconut, and I thought it adds an interesting twist! Thanks for sharing! I made this yesterday and it turned out delicious and was very easy to make! The only difference I made was I added a few ground coffee beans to the chocolate (because I’m coffee obsessed) and yummmmm!!! Your recipes are very easy to follow and I love how simple you keep things. People make things way too complicated and always add unnecessary ingredients. This was better than any cheesecake I’ve ever had and didn’t give me the horrible sugar spikes. This is my new favorite treatsie! Tuesday seems like a perfect occasion to make these :p They look absolutely amazing! This looks soooo good! Do you think it would work for a dinner party if you made it ahead of time completely and then brought it out to thaw just before dessert time? I made this for my husband’s birthday. Instead of using a square pan, I made 6 individual cheesecakes. They turned out beautifully! My non-vegan parents were blown away with how delicious they were. The birthday boy requested that they be made again and soon. Im allergic to maple. What would you suggest as a replacement? I typically use honey, as i am vegetarian and not vegan. But maybe agave? Hi Victoria! Please check out Dana’s FAQ page for an answer. Wow. Just wow! I need to try this recipe ASAP! These are too die for dear!!! Making these tomorrow! :D :D :D I can hardly wait. Thanks so much for sharing all your amazing recipes! I made these last night and they were amazing! I used unsweetened almond milk instead of full far coconut, and I thought it would affect the consistancy, but it is firm and delicious! Thanks for a great recipe, I would definately make this again! Lovely! Thanks for sharing, Rachel!! I know people think I’m crazy, but I’m not a big cheesecake fan because I find it to be too rich and too heavy. But THIS vegan cheesecake with cashews and coconut milk sounds like a winner to me! Ummm yes please!! These cheesecakes look incredible. These look incredible! I’ve tried your chocolate cheesecake before and it was beautiful, can’t wait to give this one a go! Wow this looks incredible! I love vegan cheesecakes, but I too have used a food processor and found I didn’t love the results. I will have to try the blender, thank you!! Yes! A blender is key for the filling especially. This bars look so amazing. I’m so addicted to snickers, mostly snicker ice cream. But the fact that it’s not vegan and maybe not so healthy makes me discard it from my diet plan. Holy non-cow moly! You owe me one computer keyboard. I just shorted mine out with all the drool. Wow, these look heavenly! The fact that they’re also vegan just makes them even more appealing! I just made these tonight, and they were insanely delicious. Just sweet enough. I really appreciate all of the wonderful recipes you post; I always know I can rely on this blog to have tasty and healthy food! Lovely! Thanks for sharing, Mariel! Hi! This recipe looks delicious (like all of your other ones!). I was just wondering if the coconut milk you used is the really creamy canned coconut milk or if its the kind in a carton, that is generally used for cereal etc.? I always use canned in my desserts, as the “beverage” in a carton is too thin and has too much water. Hope that helps! Thank you! I have some canned coconut milk on hand! I will be making this dessert on the weekend :) Thanks again! Once again I find myself drooling over my keyboard! Can. not. wait until we make this bad boy! Oh. My. Goodness. Dana, you’ve outdone yourself!! This cheesecake looks INCREDIBLE!!!! These look amazing! I love that they are pretty healthy too. I don’t have a high speed blender and was wondering if it would work in a food processor? Whoops! Just read your reply to my question in another comment. When I think you couldn’t make awesomer recipes, you come out with ones like this. You’re honestly amazing! I’m definitely trying it soon. I looove the way this sounds! Such a great idea! Thank you so much for your creative recipes!!! And thank you for their vegan (and often gluten free) style !! You are so great at laying out the steps and giving great photos of how things should look. They have changed our everyday old cooking and put some flair into our meals n desserts. I also really appreciate the regular intervals with which you produce recipes! You are a champion! :) So appreciate what you do. Ok, for real. This sounds crazy awesome- like so many of your recipes! But here is my drama: nuts are expensive. Like, serious expensive- and this almost 4 cups for one dessert! Where do you buy yours (Trader Joes)? I’ve tried everything; Trader Joe’s, Costco, bulk bins at New Seasons/Whole Foods/MoC, store brands from Target or Safeway.. and I just fail at justifying the cost. I love your recipes so much and I want to make them, but I don’t know how to make them affordable (dates can get kind of spendy too!). Do you have any shopping tips? I hear you … I’m in Canada and our prices on nuts are insane!! I always see awesome looking recipes like this and then don’t ever make them because a ‘treat’ is going to run me upwards of $15+. I was thinking of halfing the recipe so the price point won’t be as high and I’ll still be able to enjoy the deliciousness! Hi ladies! Buy in bulk whenever you can, especially from places like Costco. I personally find that Trader Joe’s has the best prices. I buy nuts for the occasional dessert and see it as a special treat! So if they’re pricey where you are, just find the best deal possible. Also, you can always halve the ingredients and make a smaller cheesecake! Hope that helps. I’m a Milky Way fan. Could you design a Milky Way cheesecake? Um yes, added to the list! 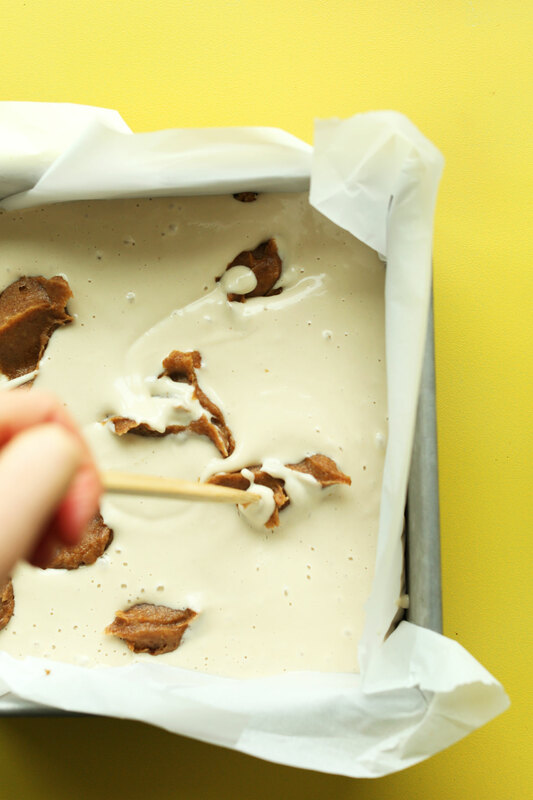 A Milky Way bar is very, very similar to a Snickers bar without peanuts….. Omitting the nuts and perhaps increasing the amount of date caramel would likely make a Milky Way Cheesecake that’s quite good. Thanks, Lisa! I’ll try your suggestions. Should u not use activated nuts? You can if you’d like! What kinds of dates do you recommend? Do they have to be medjool dates? I always recommend medjool because they are the most fresh and caramel-like when blended. But deglet noor can work, too! This is such a creative recipe. Looks delicious. Delicious! This Sounds and Looks so so so delicious!!! I Need to try this out! These look so delicious!!! Do you think it would work to use a food processor to make the filling? It will, but unfortunately it won’t be as creamy, so I always recommend a blender. I used a food processor today and it’s creamy and delicious! And I only soaked the cashews for 15 minutes. ? Oh my gosh. This looks incredible. I love everything I’ve ever made from your blog, so I’m sure I’m going to love this too. Thank you! I can’t believe these are vegan, they look amazing! 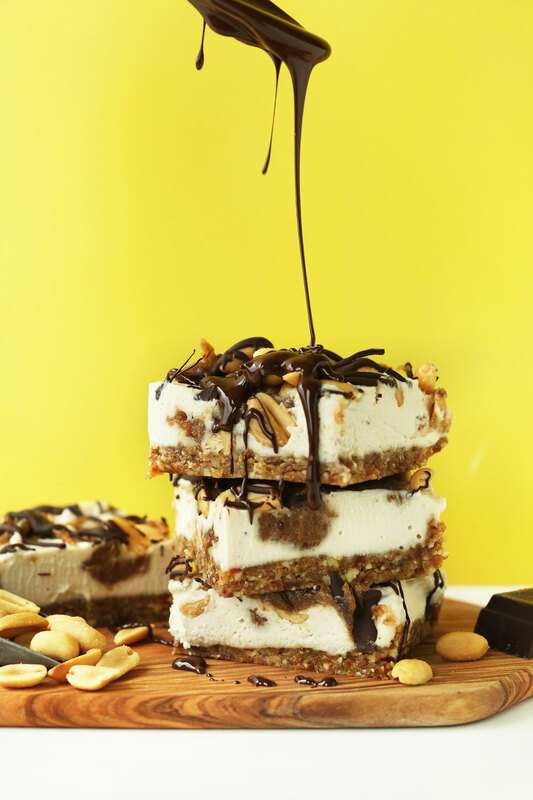 These snickers cheesecake slices look to die for! Vegan cheesecake is so so good–better than the real deal! Omg I’m drooling right now!!! I am drooling over this right now! Yum! WOW!! This looks so good! Definitely going on my list of things to make! This looks so so good! I love vegan cheesecakes :) they’re so rich without being too heavy. Heavy is my issue too. When I eat cheesecake, then I tell myself I’m supposed to go workout or something. Bleh. My mom’s cheesecake is so HEAVY! And maybe that’s why they now make Spanx for men. Until then, wife and I need to whip this bad boy up!